Sandeep K. Shukla is a Poonam and Prabhu Goel Chair Professor at the Department of Computer Science at IIT Kanpur. He is the director of C3I center dealing with Cyber Security and Cyber Defense. He is an IEEE Fellow and an ACM Distinguished Speaker. He did his Bachelor degree from Jadhavpur University and his M.S. and Ph.D. from University at Albany, USA. He has worked at Intel Corporation, USA and was a faculty at Virginia Tech..
Gerhard W. Dueck was born in Montevideo, Uruguay. He received the BSc, Master, and PhD degrees in computer science from the University of Manitoba, Winnipeg, Manitoba, Canada, in 1983, 1986, and 1988, respectively. He is currently a professor in the Faculty of Computer Science at the University of New Brunswick. After completing his PhD he joined St. Francis Xavier University in Antigonish, Nova Scotia. In 1991 he spent a year at the Naval Postgraduate School in Monterey, CA, as a research associate. In 1999 he joined the Faculty of Computer Science at the University of New Brunswick. He has been actively involved in the IEEE Computer Society Technical Committee on Multiple-Valued Logic, where he severed as chair in 1998 and 1999. He was program chair of the IEEE International Symposium on Multiple-Valued Logic in 1993, 2004 and 2008 and symposium chair in 1997. His research interests include reversible logic, Reed-Muller expansions, multiple-valued logic, digital design, and optimization of the Java Virtual Machine. He has published more than 80 refereed technical papers in international journals and conference proceedings. IPSJ in 2003. He is a member of ACM, IEEE, IPSJ, IEICE, and JSSST. Lenin Gopal received the B.Eng. degree in electrical and electronics engineering from Madurai Kamaraj University, Madurai, India, in 1996, the M.Eng. degree in telecommunications engineering from Multimedia University, Cyberjeya, Malaysia, in 2006, and the Ph.D. degree from Curtin University, Bentley, WA, Australia, in 2015. 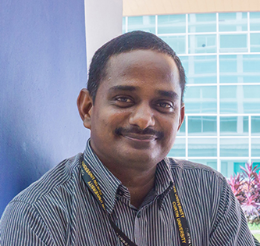 He is currently an Associate Professor and Head of the department for the Department of Electrical and Computer Engineering, Faculty of Engineering and Science, Curtin University, Miri, Malaysia. He is a reviewer for many leading international journals and conferences, and is a Chair and Technical Programme Committee Member for international conferences, and his research interests include signal processing for communications, wireless communications, and FPGA applications for wireless communications.